With So Many Variations of Baba Ganoush, What Makes My Recipe Different? There are almost as many ways to write baba ganoush (baba ghanoush, baba ghanouj, baba ghannouj or baba gannouj) as there are to make it. This famous dish is also known as Moutabal and Eggplant (or Aubergine) Caviar. This recipe for baba ganoush has to be among the easiest way to make it. Yet, it preserves the smoked flavor of the eggplant and all the other qualities we love in our baba ganoush. What Ingredients Make Baba Ganoush? Baba ganoush comes from the Levantine region yet is renown and loved all over the world. People from this region can engage in a heated argument over what ingredients are required to make this tasty dip. Most would agree that tahini is essential. It makes the end result smoother and richer in flavor. It also helps to bring everything together. People with nut allergies can obviously leave out the tahini. The amount of olive oil, tahini, and lemon juice you use to make your baba ganoush is a matter of personal taste and probably custom. Please therefore consider the ingredients here merely a suggestion and feel encouraged to innovate. Some people serve baba ganoush topped with chopped fresh vegetables, such as tomatoes and cucumbers. If you like there are many other items you can add on top of baba ganoush. For instance, pomegranate seeds, black olives, nuts, and fresh herbs all make wonderful last-minute additions. To make your baba ganoush more creamy, add a little yogurt, unless you are being vegan. 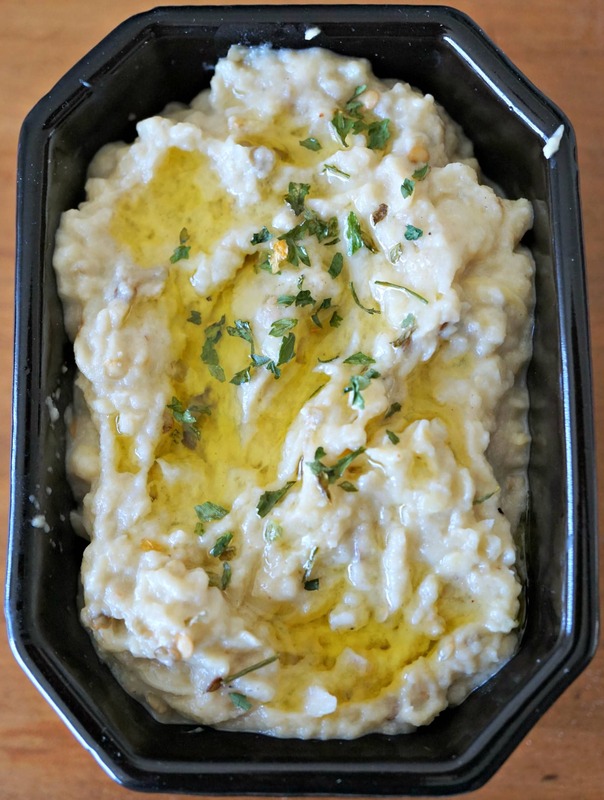 What is the secret to my baba ganoush being so tasty yet easy? I wash my eggplants and leave on their skins. I then put baking paper or aluminum foil on a baking sheet, cut the eggplants in half lengthwise and put them cut-side down on the baking sheet. Afterwards I slip them under the broiler in the oven for about 20 minutes until the flesh is soft and ready to separate from the skins. 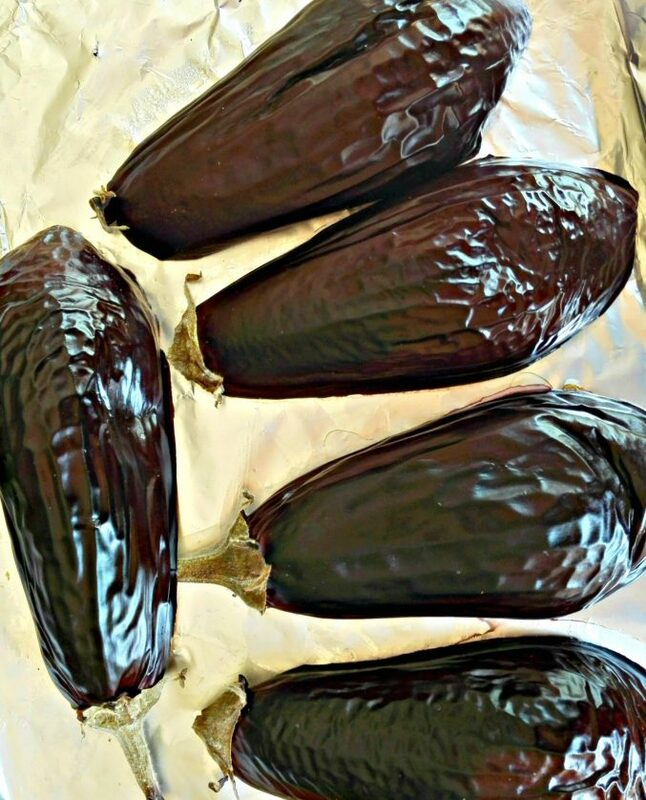 Some books suggest putting foil or baking paper on top of the eggplants before putting them under the broiler. I really don’t think it’s necessary, however. What’s Special About Broiling the Eggplant? The simplicity of merely broiling the eggplant makes this recipe special. Foodies suggest many ways to cook the eggplant, including roasting them on the stove top burners for about 20 minutes, turning them regularly. Others recommend poking the eggplant with a knife or fork several times and then putting them whole into the oven, usually wrapped in foil. If you do put them whole in the oven in foil it, remember to poke holes in the eggplants or else they will explode. I can personally confirm this! My suggestion of putting them under the grill gives the smoky flavor to the eggplant. You will not get such a smoky flavor by putting the eggplants in foil in the oven. Another advantage of the broiler method is that the flesh can be spooned out of the skins, leaving the skins in tact to use again for stuffed eggplants. I’ve even dried them out to use at a later time after re-hydrating them slightly. During the 20 minutes that the eggplants were under the broiler I made the Yogurt Spread with Radishes and Green Onions featured in my post yesterday. I also cut up some carrots and broke some matzah to eat with the baba ganoush and the Yogurt Spread with Radishes and Green Onions. The remaining steps to make this recipe are fairly straightforward, as described below in the recipe. Please read the notes for comments and variations. Remember to use your own judgment when following the proportions. You might want to follow this recipe the first time and then explore on your own. Serve this baba ganoush as an appetizer or as part of a mezze (or meze) plate with vegetables, bread, crackers. Or as a delicious spread on sandwiches, for example, with roasted vegetables! Please remember to share this recipe with your friends and to give me your comments below. 2 lemons juiced. The number will depend on size and juiciness. Pre-heat the broiler in the oven. Wash the eggplants with their skins. Line your baking sheet with baking paper or aluminum foil. Cut the eggplants in half lengthwise and put them cut-side down on the baking sheet. Put the baking sheet in the oven on the top shelf. Leave it 20 minutes or until the flesh is softened and ready to separate from the skins. Let the eggplants cool a few minutes. Watch out because the eggplants can be extremely hot directly out of the oven. Then place them in a colander and scoop the eggplant flesh out of the skins with a spoon. Let the eggplants drain in the colander up to an hour. I usually do not wait all this time. Instead I will press the eggplant flesh with a wooden spoon to push out extra liquid. If you want, save the drained liquid in the bowl to add to a soup, other dishes, or even a little back in the baba ganoush if you think it needs more liquid. 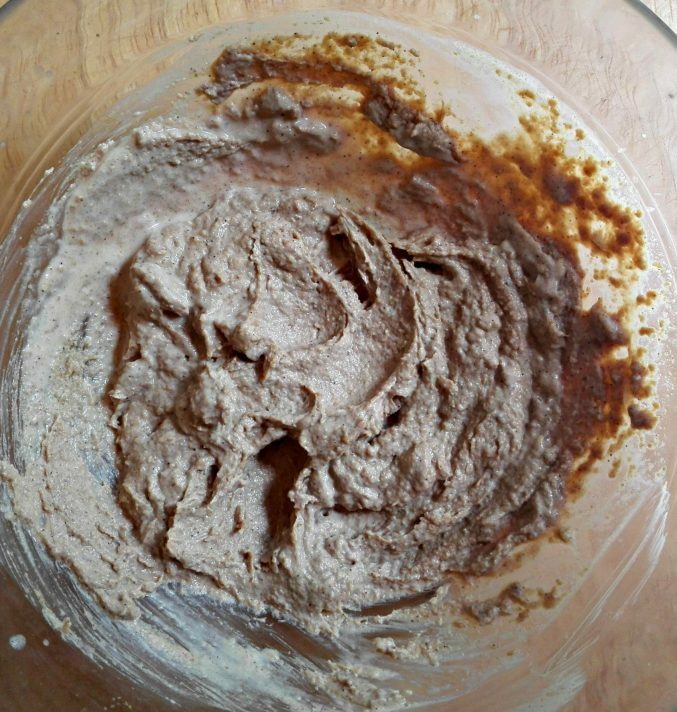 Take out a bowl and put the tahini paste on the bottom. Squeeze your lemons. 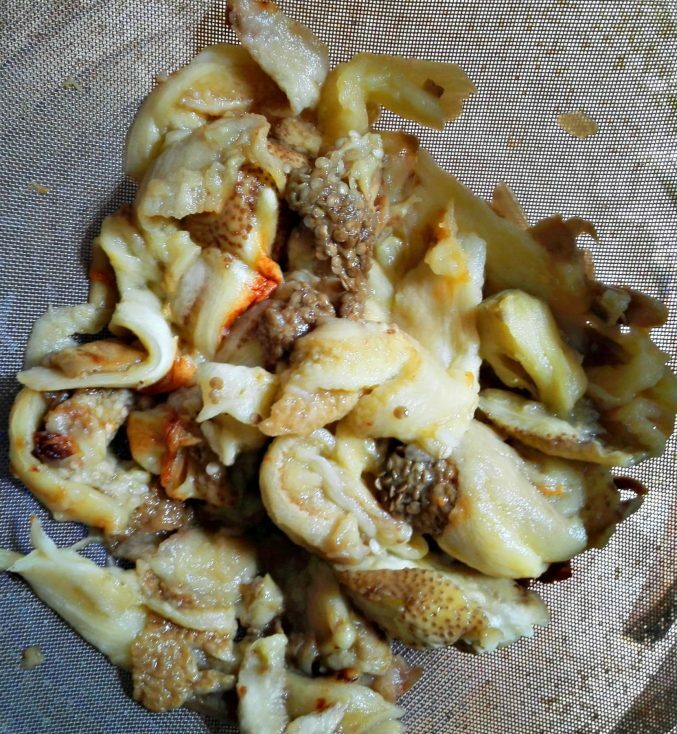 Add the lemon juice to the tahini paste and mix until diluted. The consistency should be like pancake batter (see photo). If it is too thick add more lemon juice. Add the eggplant flesh and then the pressed garlic cloves, cumin, salt and pepper. I usually do not add olive oil. If you choose to add the olive oil you could add it now or at the next step before serving. The baba ganoush is best when you let it rest about 1 hour before serving. During this time you can prepare the toppings. At time of serving add the chopped parsley and other toppings to the baba ganoush and serve. As mentioned above, you can add the extra virgin olive oil at this point if you choose. Count on approximately 250 (8 oz) of uncooked eggplant per person). The proportions of eggplant, tahini paste and lemon juice is a matter of personal taste and custom. Some like their tahini diluted by lemon juice to be more liquidy that in my photo above. I suggest starting with a the juice from 1 lemon and then adding more if needed to get the consistency and taste that you want. Baba ganoush is great just as it is with the parsley and a little olive oil on top as mentioned above. However, please explore other toppings if you wish, such as chopped fresh vegetables, such as tomatoes and cucumbers, pomegranate seeds, black olives, nuts, fresh herbs, and other items. You can also mix hummus and baba ganoush together or serve them in layers with the hummus on the bottom of the baba ganoush. It is easy, Andrea! Very tasty too! 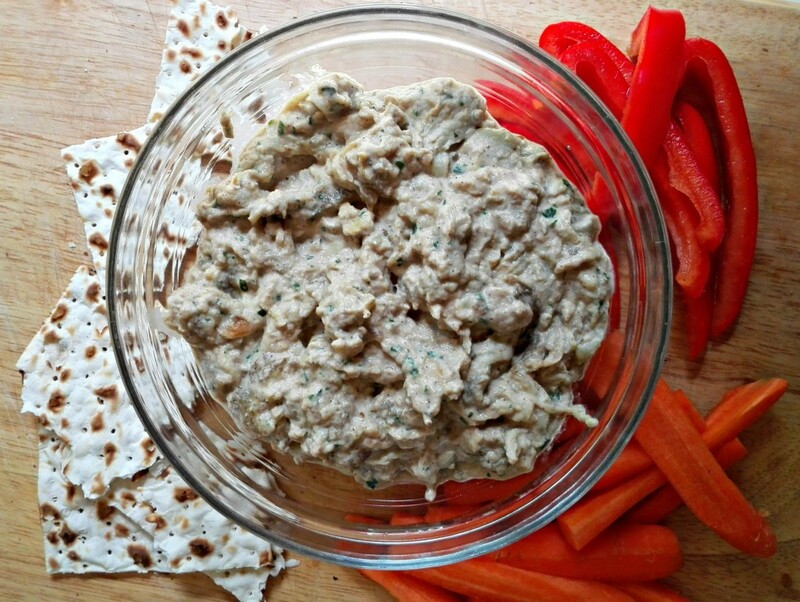 I love using Baba Ganoush and Hummus as a sandwich spread instead of mayonnaise…so much more delicious and healthy. It’s difficult to find Japanese eggplant where I live. Is it okay to use the larger Italian eggplant? Hi Allison, there’s no need to use Japanese eggplant. Italian eggplants work well too. Large oval eggplants are great. Try not to use mega eggplants as these are more fibrous and sometimes have less flavor. I was wondering how this would hold up if you wanted to freeze some? Hi Sherry, while eggplant on its own is not good to freeze, prepared eggplant is fine to freeze up to 3 months. 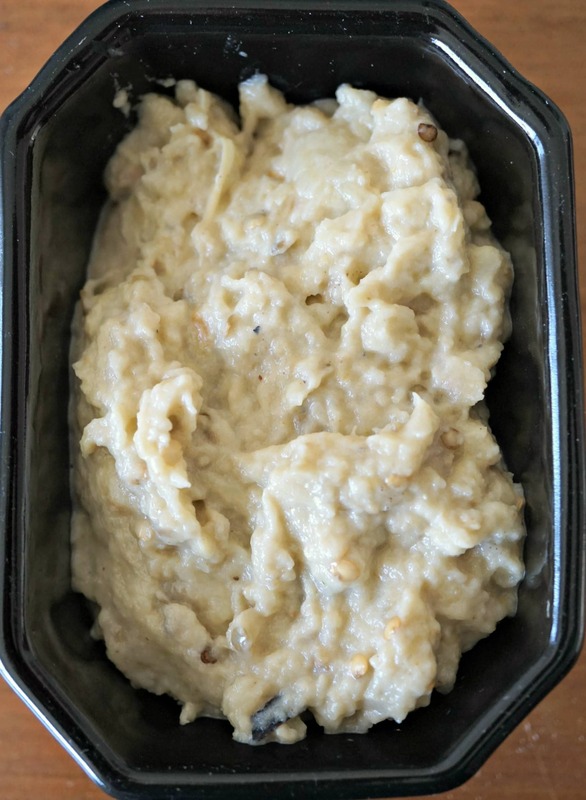 Read the notes at https://www.livestrong.com/article/475974-how-to-freeze-baba-ghanoush/ Apparently it’s important to freeze it in a container or bag that is air-tight. Please let me know how it works if you try it. Thanks for your question.